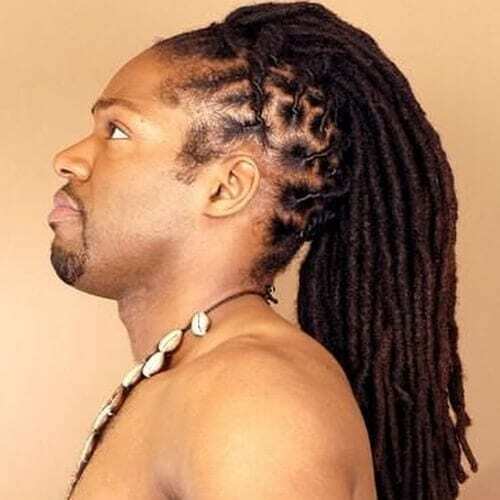 Dreadlocks date back to ancient times, far before they were popularized by alternative culture. 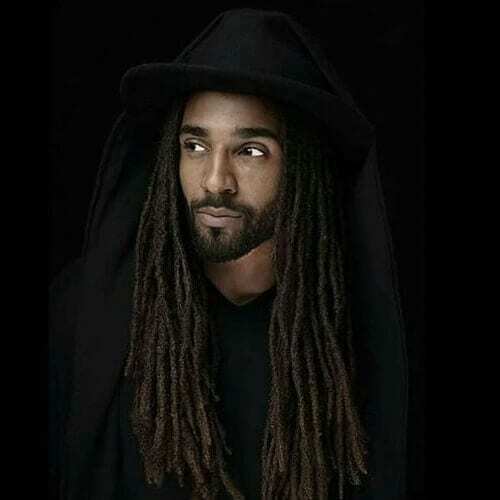 Even though they are commonly associated with Jamaica and the Rastafarian movement, the roots of dreadlock styles for men and women are in ancient times. Some of the earliest accounts point to India or Egypt as places of origins, owing to their association to gods or pharaohs. Nowadays, they’re still as appreciated and fashionable as ever, so find your look among the ideas below. It would be impossible to talk about dreadlock styles for men without bringing one of the most iconic figures that wore them in discussion. 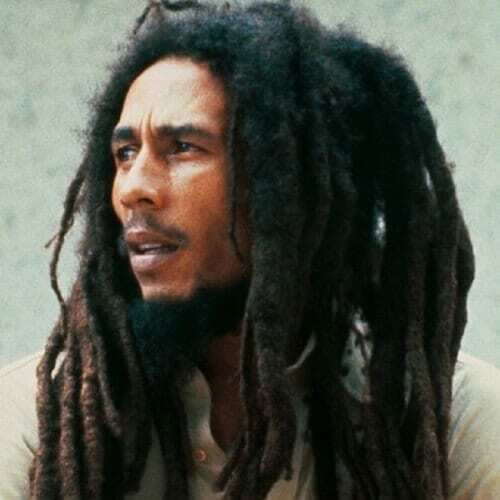 Bob Marley sported free-form dreadlocks throughout his illustrious career, up until his untimely death. 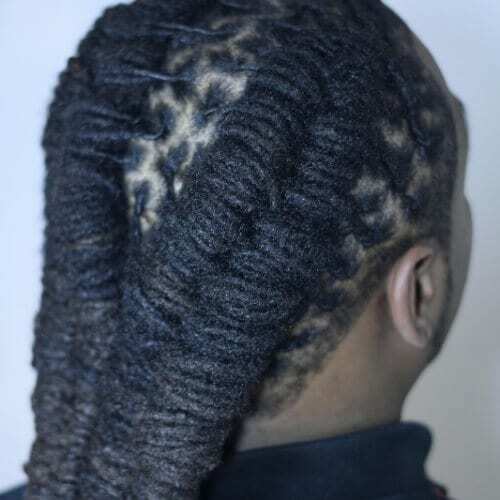 Another way to rock dreadlocks is through the two strand twist technique. These types of locks can have any length, according to your preferences. In this example, you can see how they’re paired with a high fade undercut. Here, you can appreciate how free-form dreadlocks look on shorter hair. 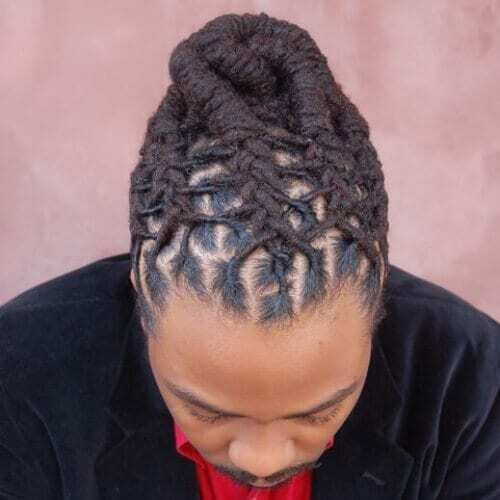 By definition, free-form locs involve the natural formation of this hairstyle. This style is also referred to as neglect dreadlocks. If you’re planning on getting very long dreadlocks, you should be aware that they might get in the way from time to time. 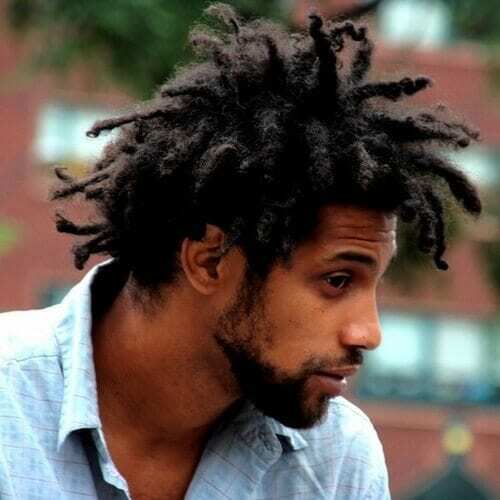 However, you can solve this problem by wrapping them in high top dreadlock styles for men, like in the photo above. This is how you can combine long dreadlocks with a sleek undercut. You can also unravel your locs if you want to cover the undercut part up. It harmoniously combines manly and clean-cut looks. 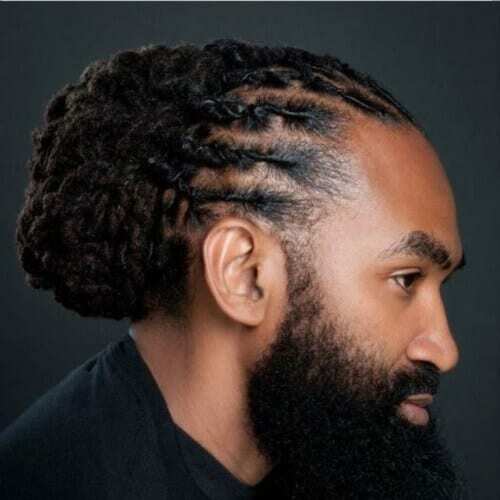 If you want an out-of-the-box approach to your dreadlock styles for men, you can combine your dreads with braids. 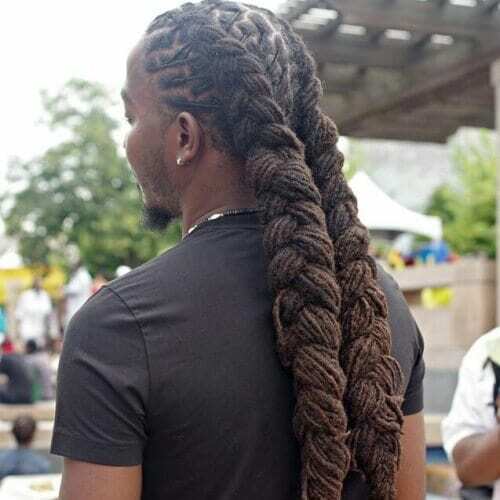 For instance, the first half of this hairstyle has tightly twisted braids, while the second flows into dreadlocks. An excellent way of maintaining long dreadlocks without the hassle is by styling them towards the back from the beginning. 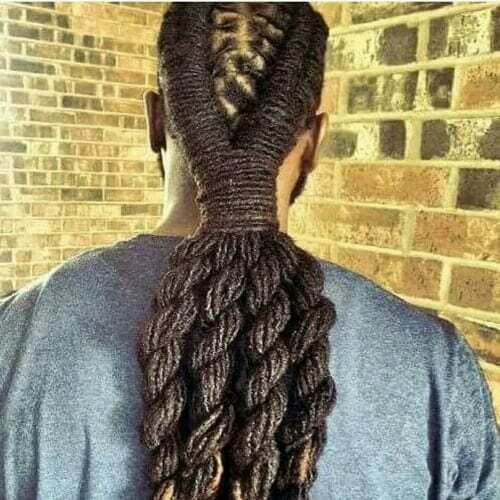 This can be accomplished either by braiding the top or paying attention to the direction of the dreads. 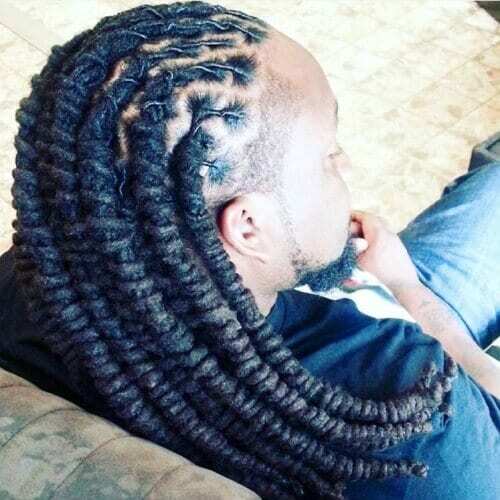 These intricately designed locs are yet another option you can look into. They’re comfortable to wear, as they won’t fall into your face. You can have the locs as thick or thin as you please. 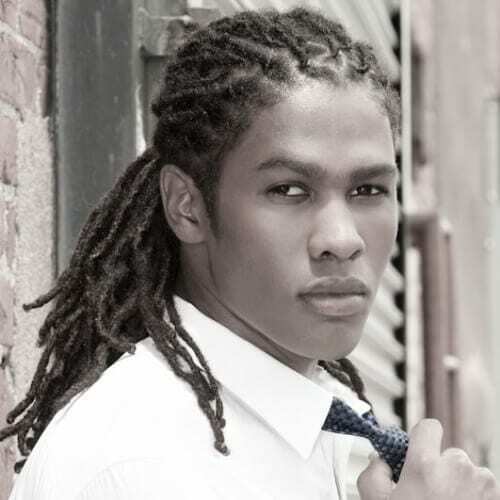 You can often find dreadlock styles for men combined with other classic hairstyles. 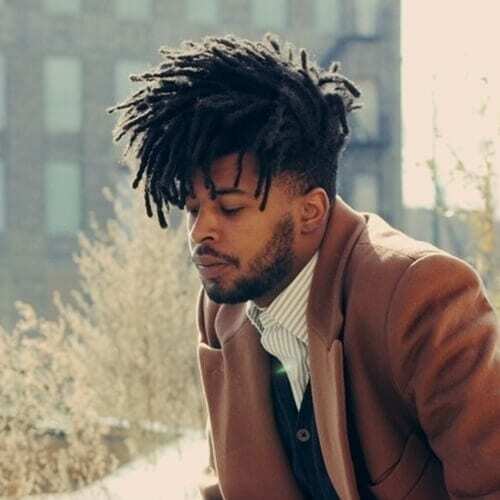 For example, these short, free-form dreads are styled in a flat top-like fashion for an easy to maintain hairstyle. Even though their maintenance might prove to be challenging, you can always venture into the world of super long dreadlocks. You will have plenty of styling options, but do keep in mind that they will require extra care. 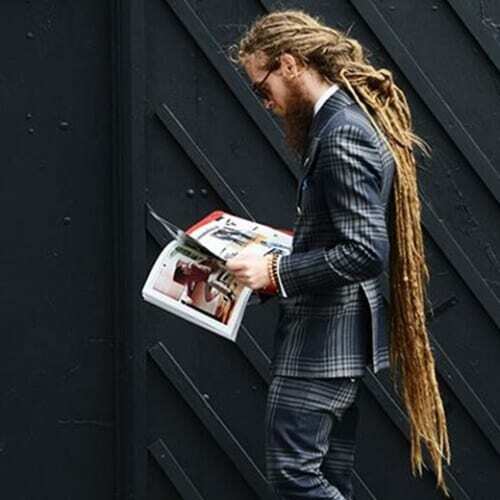 If you have an office job but you still want to embrace your roots, look into professional dreadlock styles for men. Consider having the top part braided tightly and wrapping the rest into a sharp bun at the back. Prefer a more balanced style? Then you can go halfway with medium length dreadlocks. While they’re not long enough to cause hassle, they’re not too short that they come off as bland either. 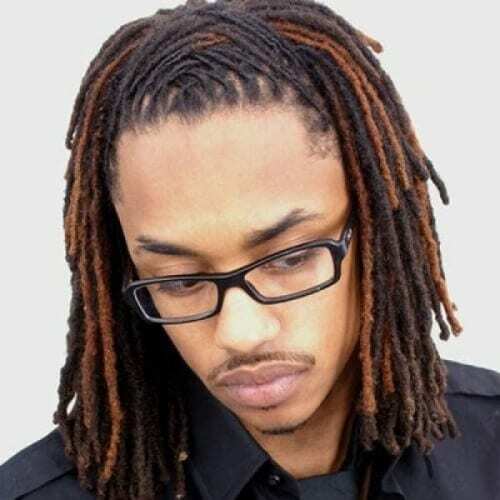 If you really want to let your imagination go wild, speak with a professional about intricate dreadlock styles for men. There is no limit to the creativity that you can put into your dreadlocks, combining them with braided and twisted styles. 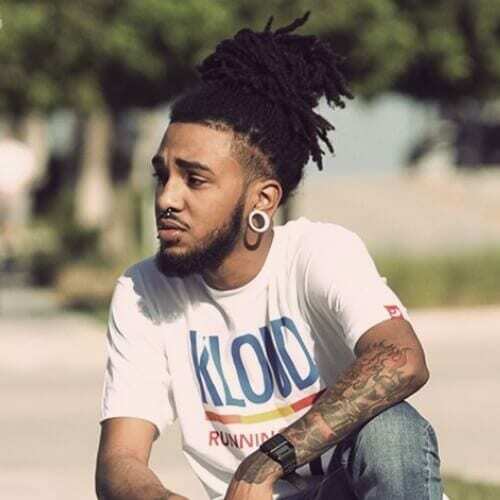 Another easy to wear hairstyle with dreadlocks is this taper fade with short locs. It is generally appropriate for school or work environments, with a classy undercut that tops off the whole look. 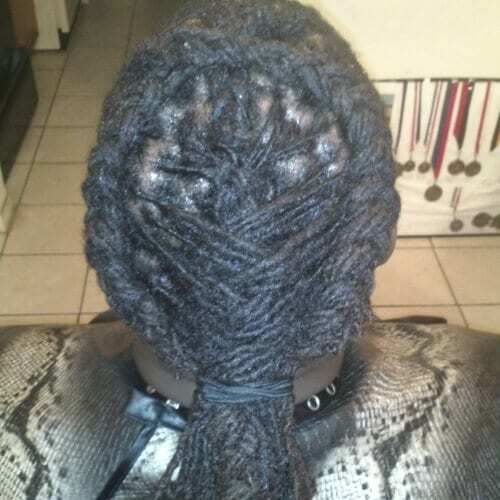 Dreadlocks can also be braided after they have been contoured as an initial hairstyle. For example, you can style very long dreadlocks as feed-in braids that rest comfortably on your back. If you’re not up for a full undercut but you still want to shape your dreadlocks, you can look into this hairstyle. 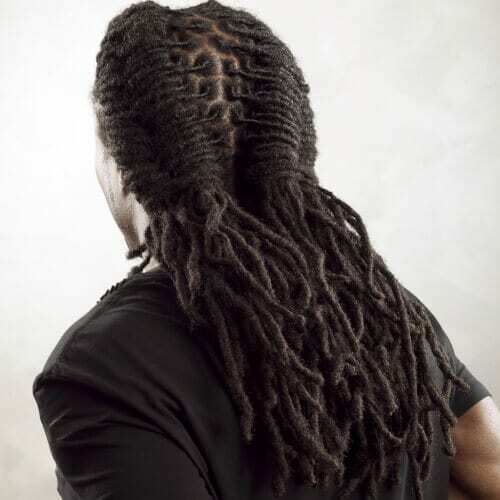 While the man in the photo sports a full head of dreadlocks, they are carefully formed towards the front, with the back and sides slightly shaved down. 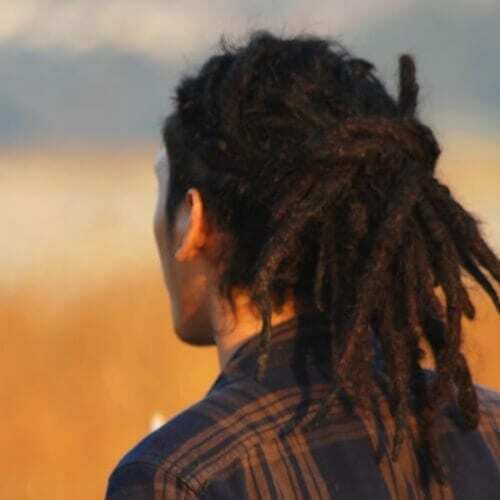 Although dreadlock styles for men are frequently found among those in colored communities, Caucasians who support the culture they are associated with can also sport them. This is an example of how to do so. 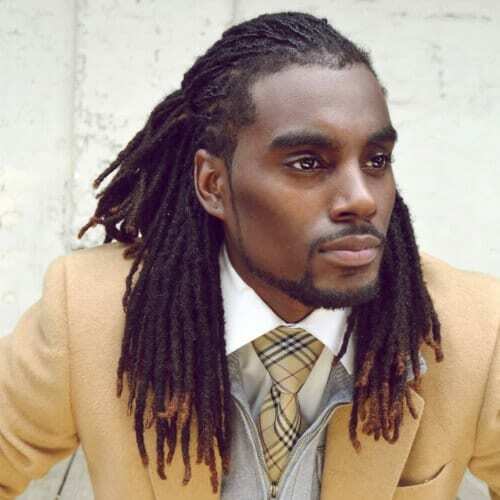 These shoulder-length dreads are exceptionally styled at the top. Strands are carefully interweaved, allowing the rest of the dreadlocks to fall naturally to the sides and back. The additional color makes the look even more eye-catching. 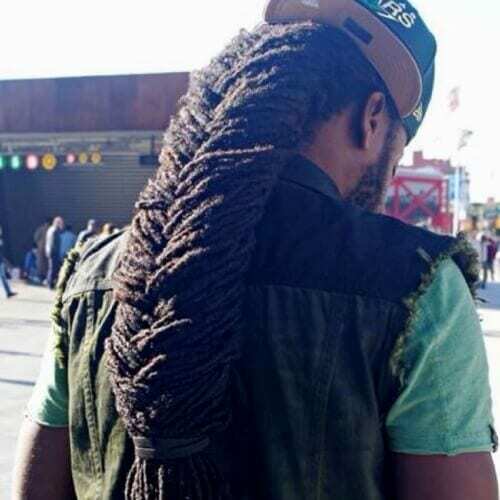 Speaking of adding a splash of color to your dreads, this is how you can do this subtly. The difference in color is indeed noticeable, but it’s not too flashy. This coloring idea works for dreadlocks of all lengths. 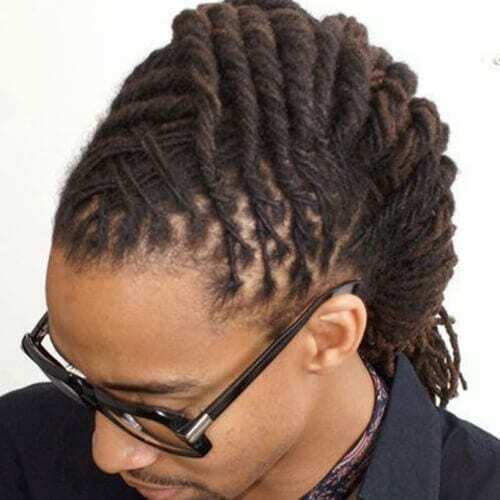 This is one of the short dreadlock styles for men that brings us back to the 90s. It is a flawless look for those who treasure the golden age of hip hop and want to maintain an all around fresh old school style. If you love the idea of having an afro, you can mix it with dreadlocks. By allowing your dreadlocks to form naturally, your textured hair will also gain the main shape of an afro. 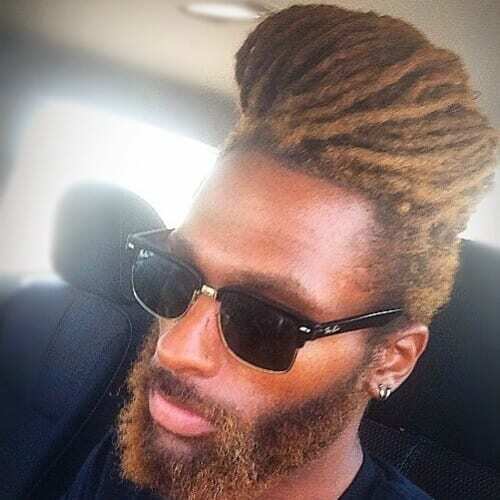 It’s yet another practical and stylish way to rock dreads. You can take the braiding part of your dreadlocks to a whole new level. 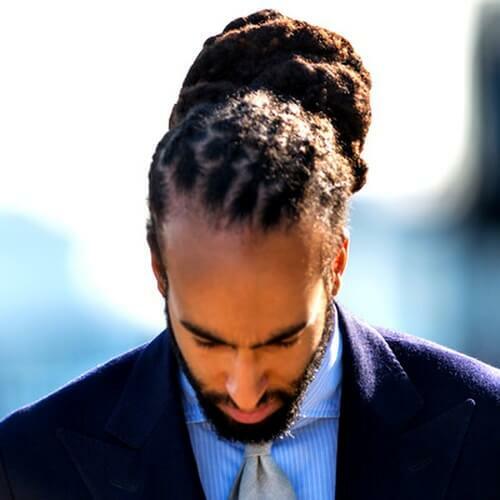 While this look will most likely require professional styling, it goes to show that locs don’t have to be worn only in their traditional form to look fine. 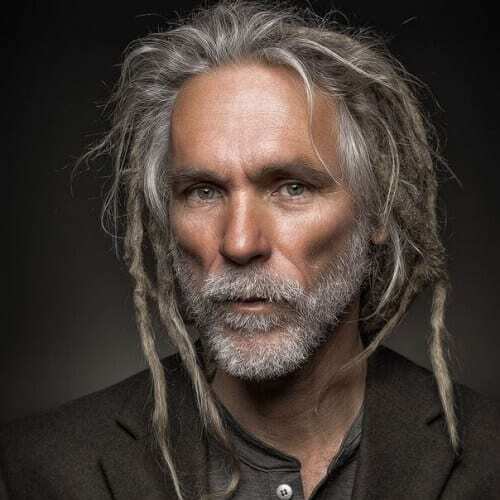 Caucasian men can also sport free-form dreadlocks. 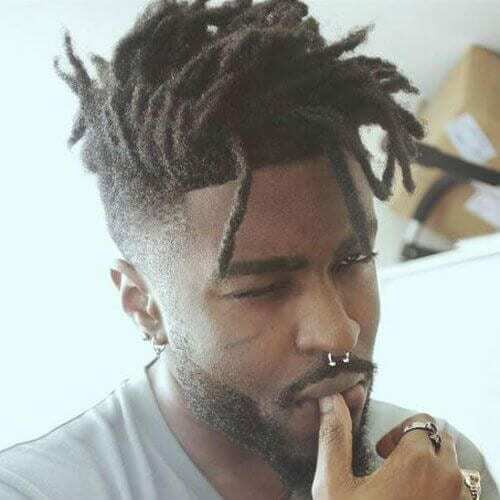 Like in the case of any other man that wants to rock the neglect dreadlocks look, all you have to do is allow your hair to naturally form the individual dreads. 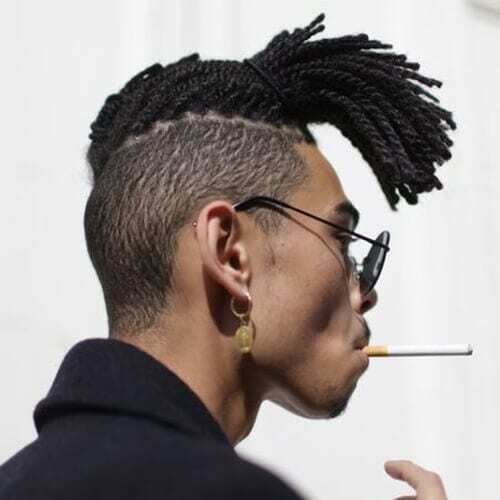 Even though this isn’t a mohawk per se, the shape of the dreadlocks reminds us of the rebellious hairstyle. 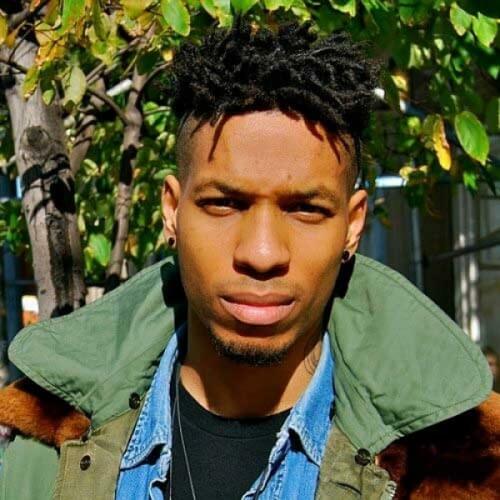 The edgy undercut boosts the dynamism of the look, while the dreads are brilliantly styled. If you like the idea of combining your dreadlocks with braids but you don’t want your whole look to be that way, go for half. You can tightly braid your hair with the technique of your choice until your reach your nape, leaving the rest free from that point. In many cases, you will find that free-form dreadlocks are rather thick or wide. Nevertheless, you can also have thinner strands for a handsome outcome. Likewise, any length will do. 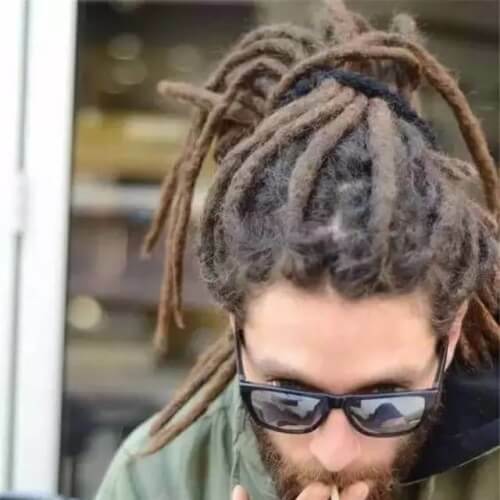 This is one of the easiest ways to wear dreadlock styles for men. You can either use one or two of your locs or a hair tie to casually wrap them to the side. Less stress, more style. If you truly want a hairstyle that will stand out from the crowd, this is the idea for you. These colored dreadlocks are spectacularly styled into a remarkable pompadour, an elegant hairstyle popularized in the 50s. 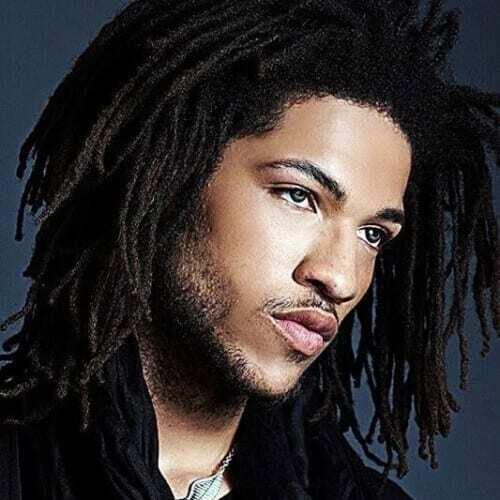 Both medium-length and super long dreadlocks can be styled like this. With the help of a basic hair tie, all you have to do is wrap the first half back so the strands won’t cover your face. It’s a great idea for professional situations. We have already talked about flat tops with short dreads, but how do you make your adaptation original? It’s simple – you can have fun with various shaved designs in the faded part. Check out our collection of creative hair designs! While this look is pretty similar to number 25 on our list, it stands out through the three separate half braids. Ultimately, it makes the look more intriguing and original compared to common varieties. 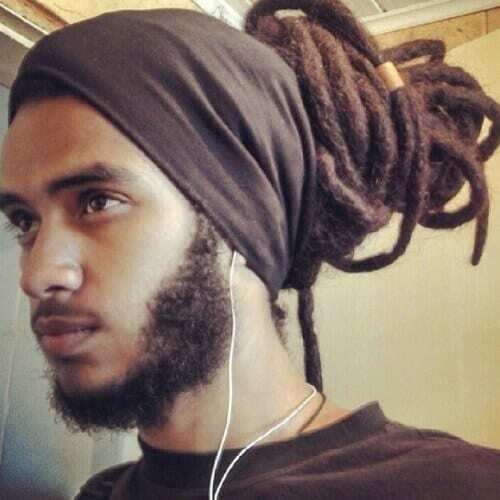 These kinds of dreadlock styles for men are fit for a gentleman. The top part is braided and tightly twisted in a cornrow fashion, while the rest is classily wrapped into a smart updo. A popular braiding technique for dreadlocks is the fishtail braid. It adds volume to hairstyles with dreadlocks, and also a smooth shape that won’t go by unnoticed. It’s perfect for men with very long dreadlocks. 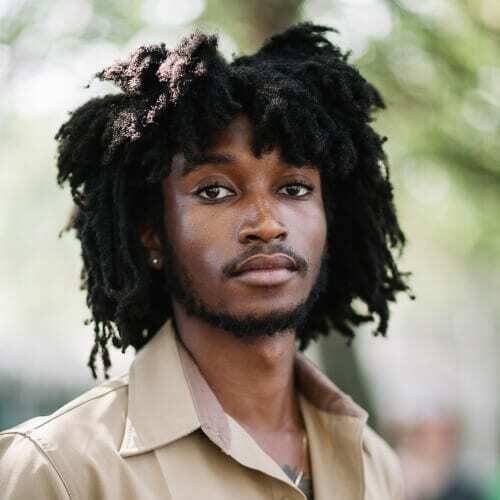 You don’t even have to struggle to style your dreadlocks if you have a well-defined shape underneath. 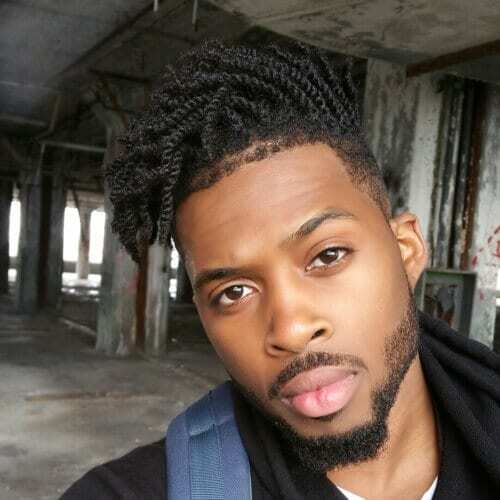 To show off your whole haircut, just casually tie your dreads to the top in a loose man bun. This is a captivating way of styling your dreadlocks into a faux hawk. 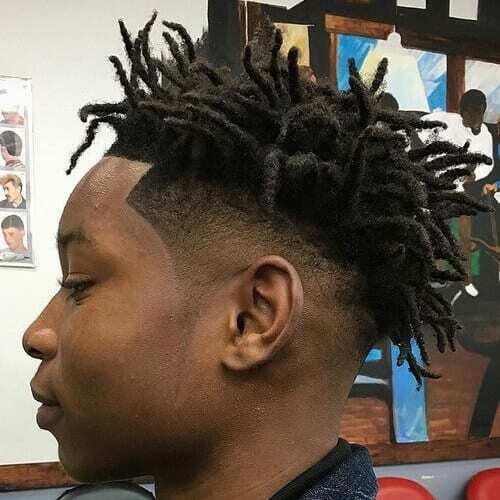 The hairstyle refers to recreating a mohawk without actually shaving parts of your hair, an action accomplished hear by tight braiding on each side. You’d be surprised to see how big of a difference even the smallest undercut can make for dreadlocks. You can have your dreads as long as you’d like and wear them in any fashion. However, if you shave about an inch all around under, you’ll see an amazing effect. For a charming or athletic look, depending on the situation, you can always go for a low hairstyle with dreadlocks. All it involves is tying the locs at the back of your neck in a low ponytail. 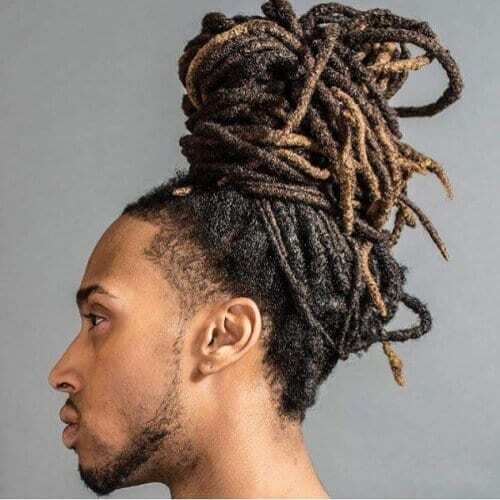 If you’re not afraid to dive into elaborate dreadlock styles for men, consider this astounding crown style. It definitely involves a good few hours for styling, but the extraordinary results are worth the time invested. If you want a permanent updo for your locs, you can think about this alluring hairstyle. It can be worn in corporate environments, as well as any casual events you plan on attending in the near future. 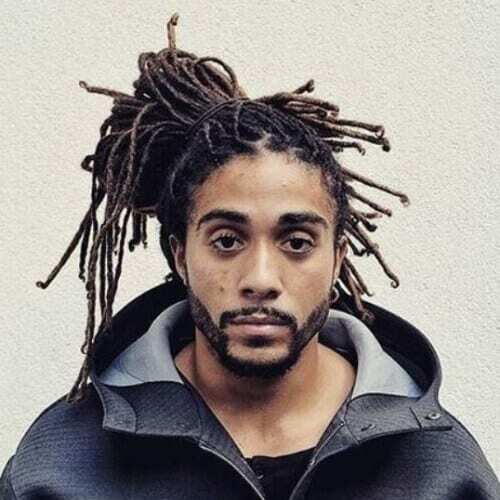 What makes this dreadlocks hairstyle unique is how it takes four different braids and connects them. They start as two on each side and are united at the back of your neck, creating an appealing effect. If you don’t want to tie up your long dreadlocks, you can always accessorize them appropriately. One idea is to wear a classy hat and an equally dapper outfit. Nonetheless, you can wear the hat that best fits your style. Head wraps are also a wonderful option for accessorizing your dreads. You ensure that your face will be free, all while enhancing the base hairstyle. 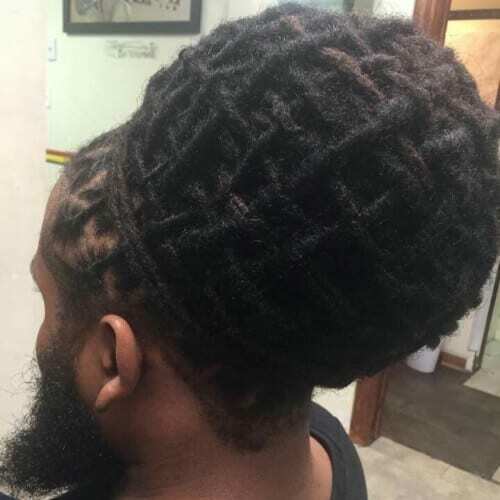 Feel free to cover your dreads entirely if you’re up for a full wrap. 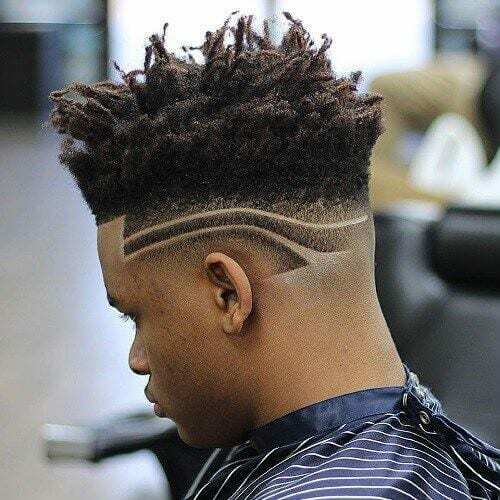 A steep undercut always does an admirable job of outlining dreadlock styles for men. 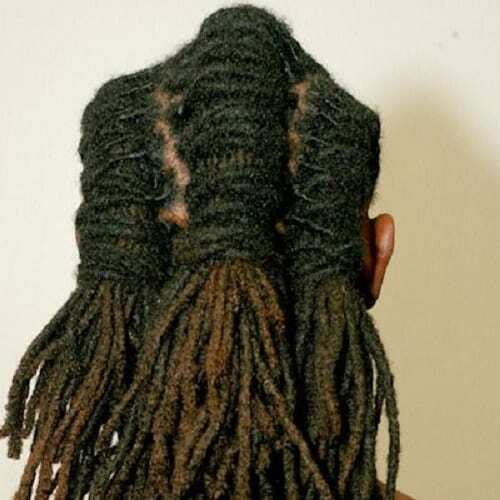 In this example, the dreads are more likely twisted locs that are tied to the front. This is one of the new school takes on dreads that you should keep your eyes on. If you’re not into sophisticated hairstyles, you can always sport a head full of casual, free-form dreads. Moreover, you can loosely knot them in the back to keep them out of the way. 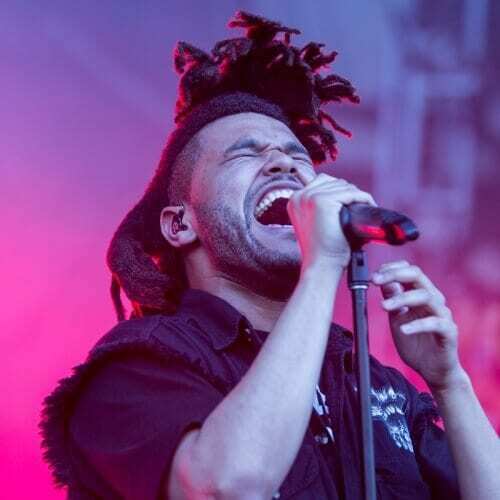 Up until this year, internationally acclaimed R&B artist The Weeknd was also famous for his outgoing hairstyle. 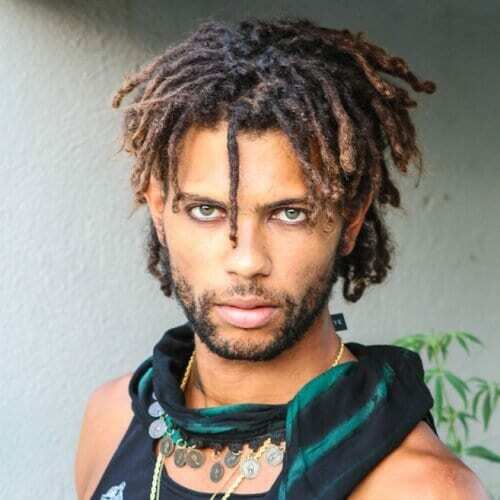 His asymmetrical dreadlocks can serve as inspiration for yours if you want a bold approach. 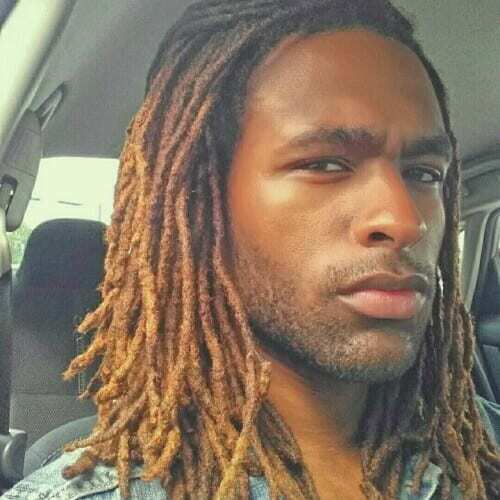 Young men also deserve a set of fetching dreadlocks. 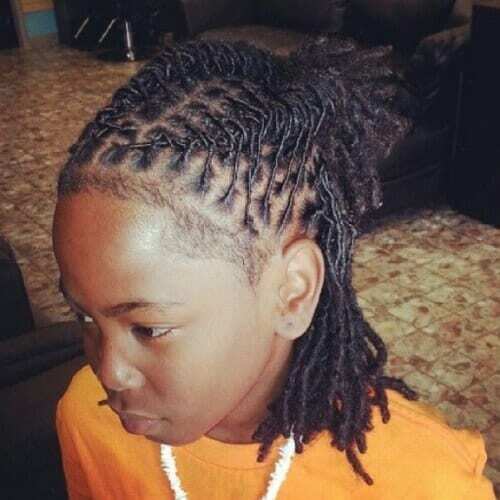 This boy’s hairstyle shows how to mix braiding and dreads for an easygoing half up half down result that works for school. If your hair is naturally straight, you’ll find that growing neglect dreadlocks might come out half and half. Owing to the natural formation of the dreads, you’ll get a mixed look you might be into. 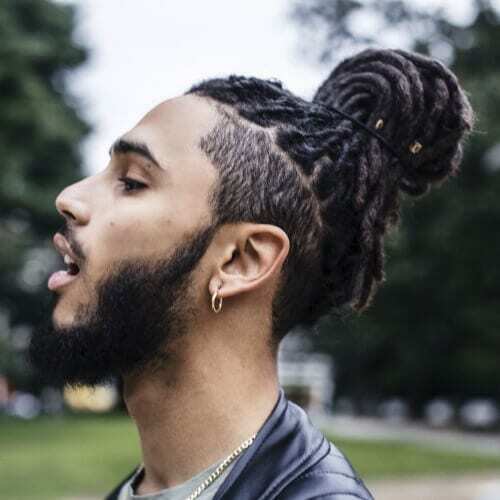 This dreadlocks hairstyle give the term ‘man bun’ a whole new meaning. The hairstyle is created with long dreadlocks, wrapped high into a large bun at the top. You’ll often find dreadlocks with a bit of color in them, but you can always add more if it suits your personality. These ombre locs, for example, show how you can rock your natural hair color with copper. 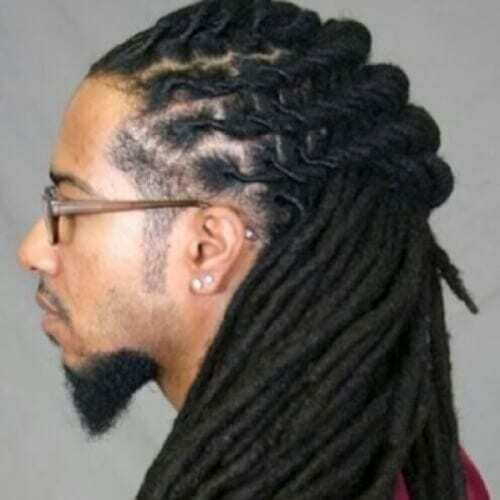 Our last example of dreadlock styles for men is this complex braided and fishbone locs hairstyle. 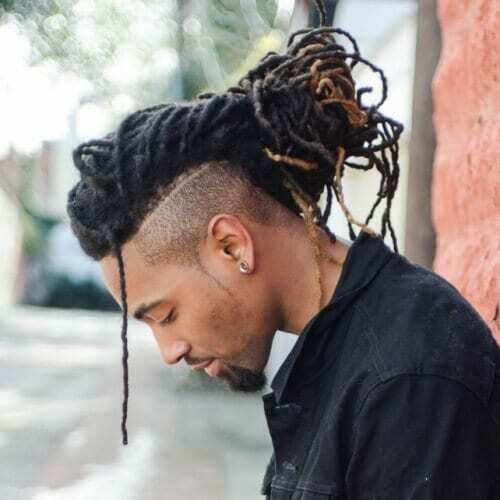 Like quite a few other intricate styles on our list, you might require the help of a dreadlocks styling specialist, but the results will be worth it. 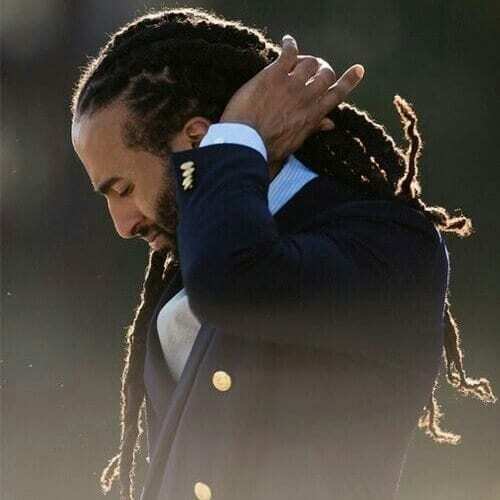 In conclusion, the dreadlock styles for men out there are various, practical, alluring and suitable for all personality types. Don’t jump to conclusions regarding this rebellious hairstyle. As you have learned, you can create an appealing hairstyle with dreadlocks that will be fine at your workplace or other formal occasions. Have fun!